To get to the Tri-State Marker, where the US states Colorado, Wyoming and Nebraska meet, you have to turn off a dirt road unto some dirt tracks across a field and hope that your four-wheel-drive will get you through the deep dips by the windmill and that there actually is a marker on this field. There is! There are no signs by any of the roads or dirt tracks that will assure you that you’re headed in the right direction. The only way I found it was by following the GPS coordinates, which weren’t exactly accurate (N 41° 01 W 104° 03) and eventually just turning onto the field near the coordinates on a wing, a prayer and the intense winds up there this week. Because this was definitely one of those cases of the journey itself being the destination, I’m showing you some of the roads leading there and our trusted 4Runner. Because the wind was so intense, I also kept some shots that are a bit wind-wobbly and one of Whiskey with her ears blowing in the wind. 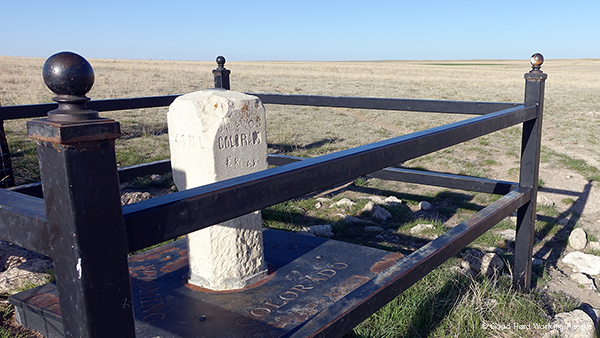 An interesting fact: In 1896, the original marker was placed a few hundred feet away from where the states where actually supposed to meet. Instead of moving the marker, the powers that be found it easier to redraw the map. So this marker actually determined where the boundaries are, which makes this place a little more important than it seems (considering there are no signs to find it). The song in this video is called “Mountain Sun” and was written and performed by Jason Shaw, who made this song available via the CC BY 3.0 license. Thank you for all your great (and free) music, Jason!